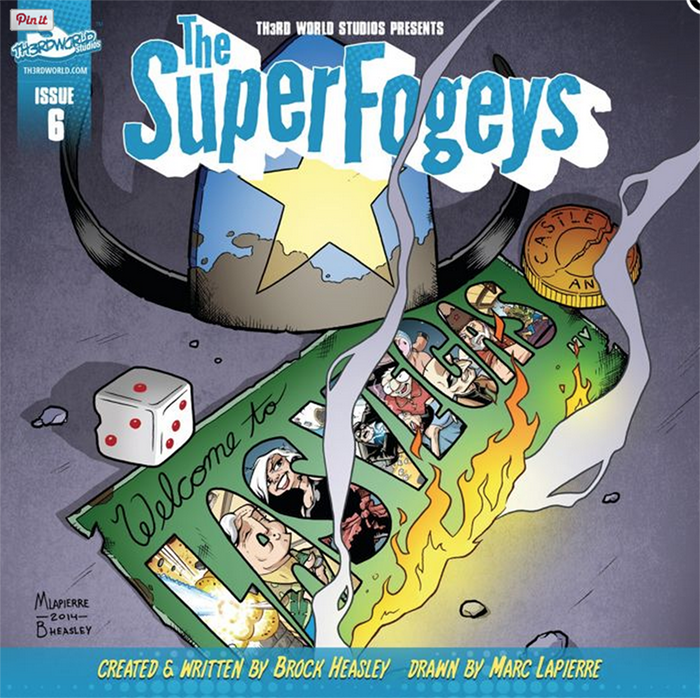 SuperFogeys Issue 6 Now on Comixology! Woo-hoo! 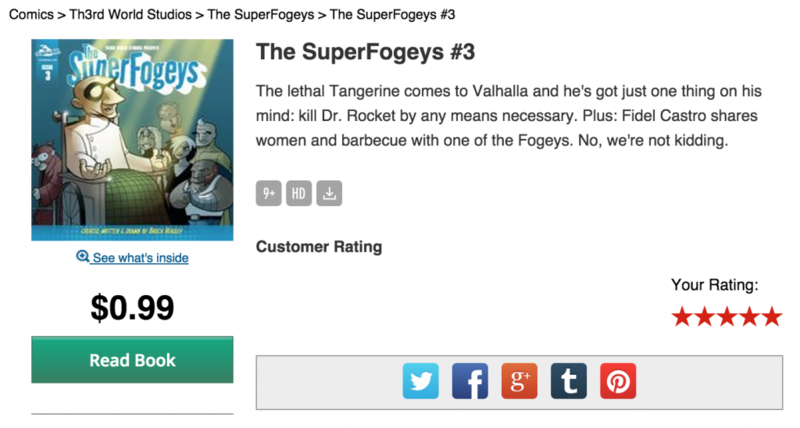 6 issues of SuperFogeys are now available for your reading enjoyment on Comixology! The 6th issue is a big one as it contains Chapter 12, “Jackpot!” I consider Chapters 1-12 the first half of the SuperFogeys saga, so it’s great having all of them up and available as a group. The price of issue 6 is still just 99 cents, though I don’t think that price is going to stay that way for long. Since the first issue is free, you can get chapters 1-12 all for a measly 5 bucks. Not bad. Go check out issue 6 of SuperFogeys on Comixology right now! Or… see the entire SuperFogeys collection! Censored! ...but you get the idea. We’re just five days away from SF’s big return for Chapter 20, “Crossing Worlds,” but, as those who are already our patrons on Patreon know, we’ve been revealing all sorts of stuff already. I imagine some of you are wary of supporting us on Patreon. After all, SF has always been free. Why should you have to pay for it? Well, you shouldn’t and you don’t HAVE to pay for it. But we believe that if you enjoy then you want to pay for it, at least a little. We love bringing this story to you and we’ll continue to do that, but making SF is no easy feat and drains resources we don’t always have. All we’re asking on Patreon is, if we’ve earned a bit of good will with you, that you’ll throw a little coin our way to help us out. Our goals are stuff like helping Marc to pay for art supplies and allowing Brock to actually work on SF during the day (and get actual sleep at night!) when the pressure to engage in activities that make at least a little money is the highest. “But,” you may be saying to yourself. “I don’t have a lot of money to spare.” Not a problem. I set up the Patreon to allow the most flexibility possible. We’re asking for donations per strip, but you can set a monthly maximum that suits your needs. Only want to pay $1 month? Then pledge at the $1 level and cap your monthly maximum at $1. That’s perfectly okay! If a lot of people did that it would add up fast! 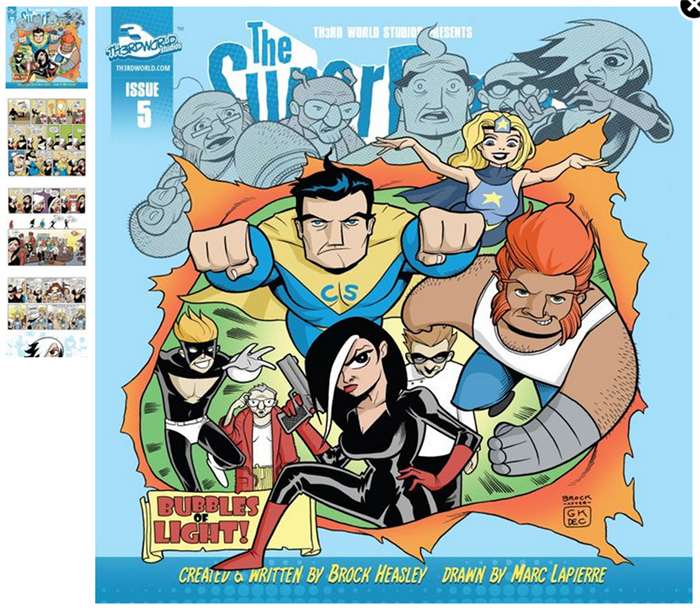 • Multiple art sneak previews of upcoming strips–both in pencil and final, colored form. • Full looks at the NEW SuperFogeys heads (drawn by Marc and reflecting the current storyline) going in the masthead of the website (everyone else will only see half the heads, and then only when they appear on the site). • Early look at the promo graphic featuring almost a dozen images from the new chapter that’s being slowly revealed over on the SuperFogeys Facebook page. 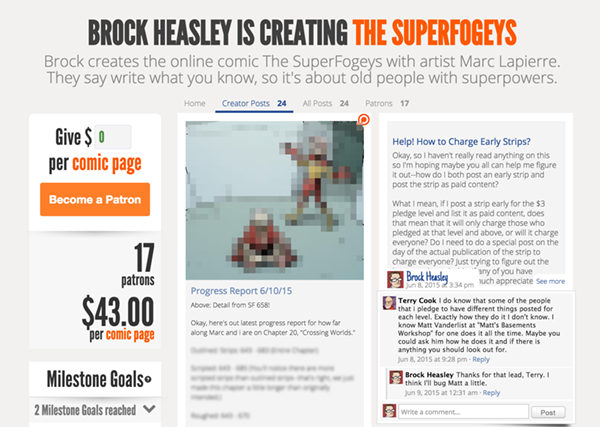 • Process Art images for Brock’s art for the SuperFogeys Celebration graphic announcing our return on June 15. And, of course, there’s lots more to come. Especially as the actual chapter launches. Here’s the link to our Patreon page one more time. Over there, you’ll also see the fun video I created to explain how it all works. Am I good on camera? Probably not, and that’s worth at least a laugh, right? Hope to you see you over there! 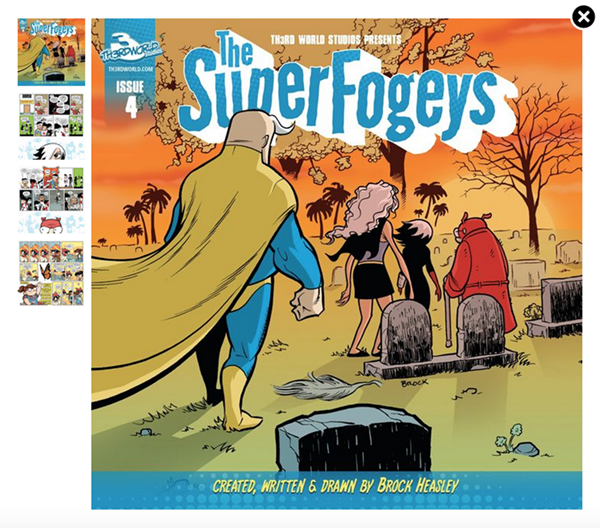 SuperFogeys Issue 5 Now on Comixology! Three weeks in a row with new SF Comixology issues. How cool is that? Just 99 cents… for now. That WILL change soon. That means you could get all 5 issues of SF on Comixology for just $4 (first issue is free). You can’t argue with that price. You can try, but you would fail.